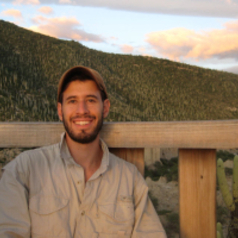 My research interests focus on questions of biogeography, vegetation change on decadal and millennial time scales, and documentation of biodiversity among others. My career goal is to link research and effective conservation, especially in Mexico and deserts. Understanding, exploring, and conserving the Sonoran Desert is my passion. I am currently working on my dissertation, which focus on the historical biogeography of the Midriff Islands in the Gulf of California. For the past seven years I have worked on in this region, collaborating with members of the Comcaac or Seri community and learning from my mentor Richard Felger. Our work has documented the island floras as they are found today, unique microcosms shaped by aridity and maritime influences, as well as highlighting intriguing plant distributions that indicate markedly different conditions thousands of years ago. It is these puzzling biogeographic patterns that I am attempting to decipher in my dissertation. Stepping away from the scope of my dissertation, continuous expansion of my work in Mexico in the Sonoran Desert and regions further south provides great joy and motivation, which I hope to pursue in the coming years.